GEt SKYPE & Make FREE Calls! STEP 1 - Click the Skype banner below & download Skype 2.5 - very easy and FREE. STEP 2 - To listen to my Skypecast , just turn on your computer speakers & click my Skypecast link above. STEP 3 - To talk you'll need a computer with a built in mike OR a cheap headset (pick one up at Radio Shack) that you plug into your computer. Skype lets you TALK FOR FREE and SKYPECASTS are like big, interactive conference calls or broadcasts. Copyright © 2004-2007 My Dog Votes™. All Rights Reserved. The My Dog Votes™ trademarks and/or service marks, name, paws, designs and trade dress are the sole property of My Dog Votes™ and are protected by international copyright and trademark laws. 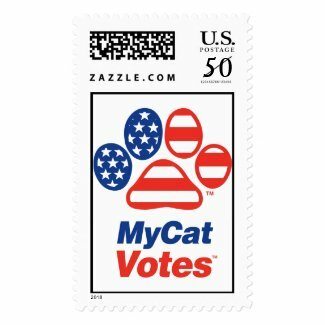 My Cat Votes U.S. Postage Stamp! How cool is this! Now cats have equal time! Great for stocking stuffers, holiday gifts and more! Stamps Out Voter Apathy. More Stamps! Now, everyone can join the campaign! My Cat Votes At Zazzle! Get Unlimited Anytime Minutes FOREVER when you sign up for Amp'd Overload and Overdose - www.ampd.com! Offer good for limited time.